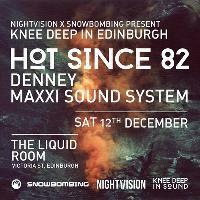 Hugely excited to welcome back Leeds legend Hot Since 82 to Nightvision for another huge installment of Knee Deep in Edinburgh! Those of you at last year's show will remember it as a highlight of our first series and this time he is joined by non other than Denney and Maxxi Soundsystem. What's more, this is also a special Snowbombing show, part of the festival's 2016 Launch Party Series, where parties are held in the UK and Europe to celebrate the forthcoming festival. In conclusion, this is one pre-Christmas party NOT to miss out on.